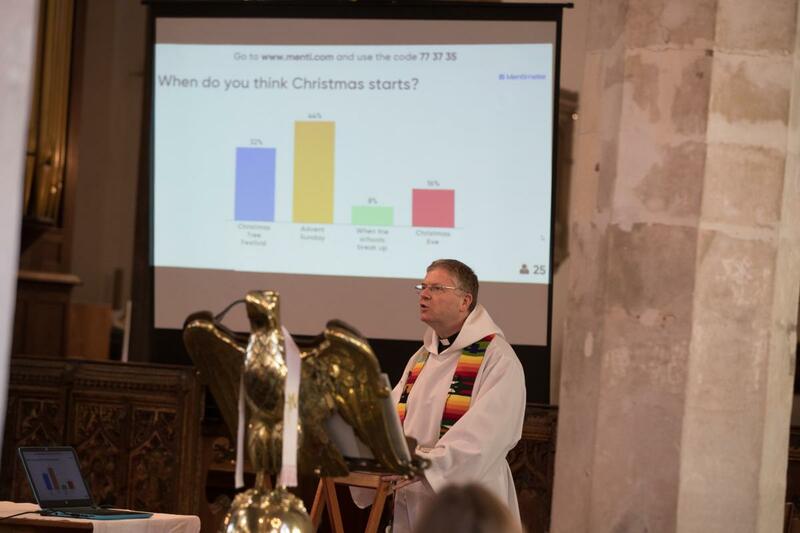 A church is trialling the use of a live voting smartphone app during sermons to improve the engagement of the congregation. Those attending Aylsham Parish Church in Norfolk are asked to take their phones to services and use them to answer questions. The questions will be displayed behind the vicar on a projector screen. They can also rate hymns they like or dislike to improve future services, and the app has also been used to create a “word cloud” of things the congregation is praying for. The more the people ask for a particular word, the larger the word will appear on the screen. Reverend Canon Andrew Beane said: "It has given us an opportunity to be much more interactive in our worship". The church already offers its congregation free internet access through a scheme called WiSpire, and has TripAdvisor, Facebook and Twitter pages. The app has currently been used in three services and plans to do so for future special events. Reverend Beane said: "Sometimes you can ask a question and people are shy, but by using the app, everybody joins in." He added that he has already had inquiries from other churches about the technology.